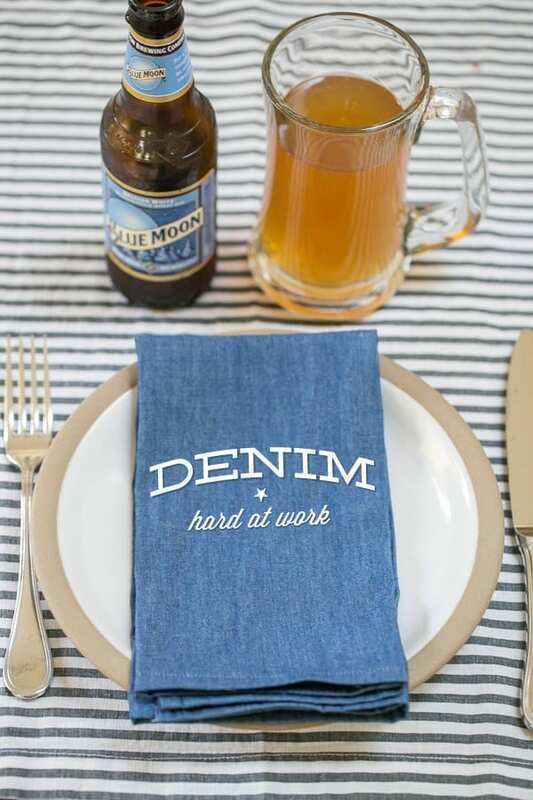 Inspired by our worker’s holiday this coming Monday, we came up with the idea to create some darn sturdy dinner napkins, made from the one and only…denim. Companies such as Levi’s have made this material an American classic. From working farmers to 80’s supermodels, denim has been the go-to material for just about everyone! I think we can agree that denim is the one hardworking material that’s not going anywhere! So get out your old jeans and let’s make some napkins that are perfect for BBQs or great for hostess gifts! If the old jeans you’re using aren’t soft, you’ll want to stick them in the washing machine with some tennis balls or sneakers and fabric softener. Here’s a tutorial on how to soften denim. 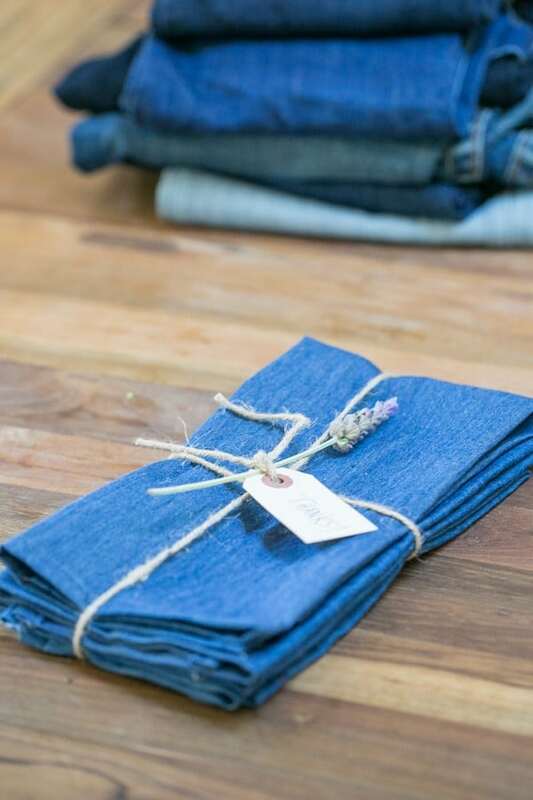 Once your denim is softened and dried, lay it out and cut four 19 x 15 inch rectangles. Starting with one side, fold it 1/4″ inch in, then fold it again another 1/4″ and iron. Keep it together with pins. Do that to all of the edges, this is so you won’t have a hard seem. Sew a straight line just along the folded edge, reinforcing when you get to the ends. Do this on every side. Those denim napkins are such a great idea! Those would be great for Memorial Day or 4th of July. I need to make these! Yes!! Great for the 4th of July!! Thanks for the comment Brittany! Great idea Eden, love that look and good tips on the jean softening thing. For a sec, I thought stones, but that may not be good for the washing machine. HAHA! Thanks Skye!! Yeah, stones might not be good, but we do get an occasional rock in the washing machine now that Romeo is exploring!! Shoes seem to work great though! This is a great idea! 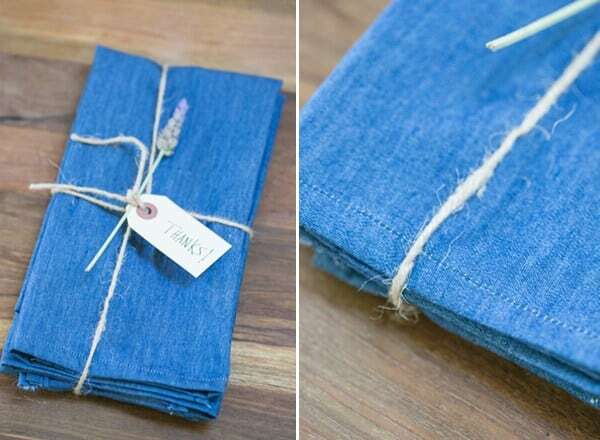 I’ve never thought about using denim for napkins! I love the idea though. I have lots of blue jeans that I am not using. And I was thinking of buying some thick napkins. Glad I read this before I bought them. Question….I’ve not tried this yet, but I’m trying to figure out how you get a piece of denim from jeans without the pockets, etc cut that large. Hi Lisa! We didn’t use the pocket part. I cut the long, leg part of the pants. Although, maybe it would be cute to cut a square around the pocket and make a little napkin using the pocket too!